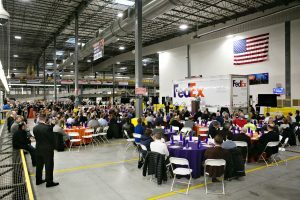 FedEx Ground celebrated the grand opening of its long-awaited new Lehigh Valley distribution hub on Nov. 9, welcoming hundreds of visitors to the 850,000 square-foot facility that employs 1,000 people and can process up to 45,000 packages per hour. “The Lehigh Valley has long been an important market for us,” said Scott Burns, Fedex Ground’s Vice President, Eastern Region. Located on Willowbrook Road in Allen Township, the Lehigh Valley hub is part of the FedEx Ground network of more than 600 facilities. Its local delivery area will go as north as Stroudsburg, as east as Flemington, N.J., as south as Boyertown, and as west as Breinigsville. The $335 million facility officially opened in September 2018. Future expansions are also planned, company officials previously said, and at full build-out in 2030, the megahub will be 1.1 million square-feet and employ more than 3,000 people. Package volumes for FedEx Ground have doubled in the last decade, and the company has opened 17 new hubs and expanded or relocated more than 500 local facilities to account for this growth, Burns said. 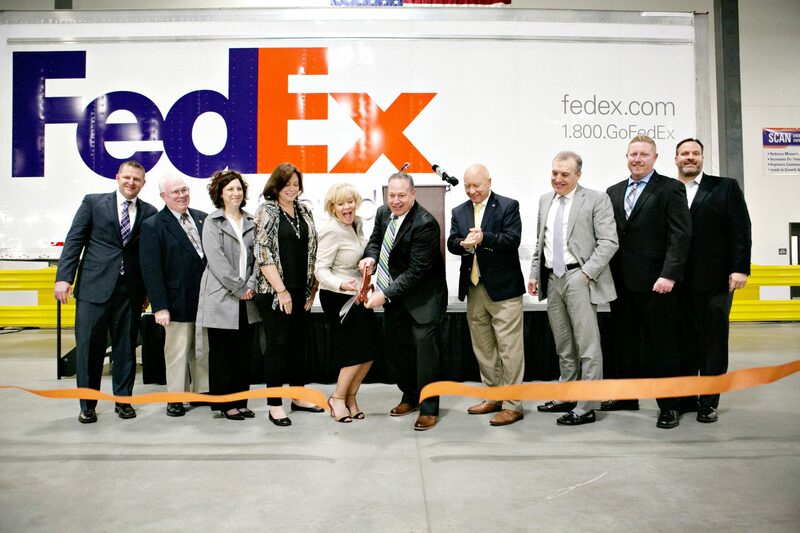 “We continue to strategically invest in our network, including this fully automated hub in the Lehigh Valley, to boost daily package volume capacity and further enhance the speed and service capabilities of the FedEx Ground network,” he said. The Lehigh Valley Economic Development Corporation (LVEDC) was an early champion for this project due to its role as a major job-creator and infrastructure asset for the region. It will also drive new development due to businesses that want to be near a FedEx hub that can sort large amounts of packages quickly. The Lehigh Valley hub will play a key role in FedEx Ground’s recent announcement that it will operate six days a week year-round throughout its U.S. network to address the growing demand for e-commerce and residential deliveries, Burns said. In the past five years, the company has added nearly 36 million square feet to its network, including new hubs similar to the Lehigh valley facility, as well as 58 automated stations around the country. After several years of planning, which required seeking approval from multiple boards and and overcoming several legal challenges, the Lehigh-Northampton Airport Authority closed its deal in 2016 to sell 253 acres of airport-owned land for the project. Burns said the local HR team worked closely with Workforce Board Lehigh Valley and representatives from the Lehigh and Northampton Transportation Authority (LANTA) to establish a bus route convenient to the hub location. Cunningham praised the coalition that helped make this project happen, including LVIA, developer Rockefeller Group, the Pennsylvania Department of Transportation, the Lehigh Valley Planning Commission, the Northampton County Industrial Development Authority, the townships of Hanover and Allen, and the regional legislative delegation. “It took a great public-private partnership to make this happen,” Cunningham said.